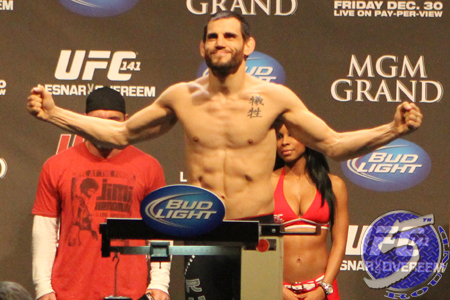 As anticipated, Jon Fitch (Pictured) wasn’t standing in the unemployment line for long. According to MMAFighting.com, the former UFC welterweight top contender has agreed to join World Series of Fighting. Fitch is expected to make his promotional debut at WSOF 3, which takes place June 14 at a yet-to-be determined venue in Las Vegas. The UFC set off a firestorm last month when they unexpectedly fired Fitch. UFC President Dana White cited the 34-year-old’s decline, high price tag and less than thrilling fight style as the reasons behind his release. Although Fitch owns a respectable 24-5-1 (1 NC) professional record, he’s gone just 1-2-1 over his past four outings. His salary for UFC 127 and UFC 153 were not disclosed because they took place overseas. However, he scored an average of $63,000 just to show up for UFC 141 and UFC 156. Five scraps ago he pocketed $54,000 to show. Fitch’s price tag, albeit likely decreased, didn’t appear to be an issue for the up-start mixed martial arts promotion.